DUMPSTERS, RECYCLING, LEED PROJECTS, AND MORE! FOR ECO-FRIENDLY CONSTRUCTION, RENOVATION AND DEMOLITION PROJECTS. We offer a variety of turnkey services to simplify your projects and protect the environment. We are experts in cleaning up worksites and collecting and recycling residual materials to reduce the amount of buried or incinerated waste. We propose a wide range of services that are efficient, affordable, eco-friendly, and tailored to you. See how we can help with your projects! Services for a clean, safe and environmentally friendly worksite. We offer a wide range of containers for rent, from 2 to 40 cubic yards, as well as a collection service to pick up all of your debris from construction, renovation or demolition (CRD). Mélimax is simple! Order your dumpster, receive it quickly, load it up with dry materials, and call us: we’ll unload it at one of our recycling centres. With Mélimax Express, you’ll get more flexible and quick collection service: in under 24 hours if you want! Set the schedule and frequency; we’ll accommodate your needs and availability. We can help you obtain LEED certification, issued by the Canada Green Building Council, by providing dumpsters for this purpose, as well as traceability reports for recycled waste materials. 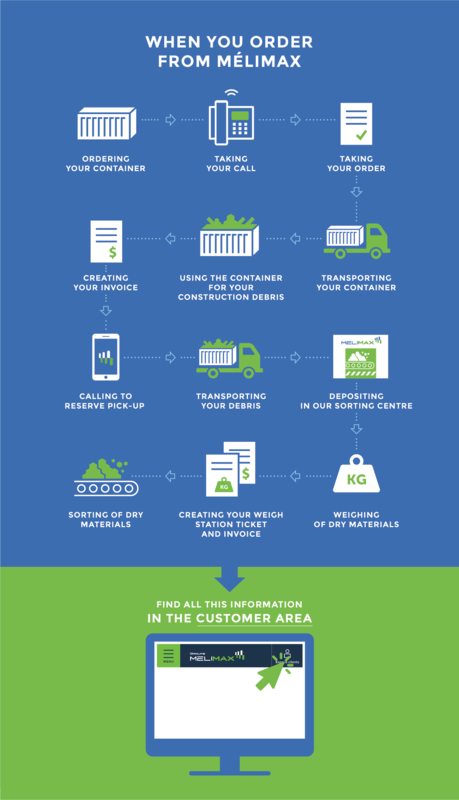 We provide access to our ecocentre, as well as our two sorting centres, if you want to drop off your own waste materials from construction, renovation and demolition projects. We supply mobile toilets (also called chemical toilets), perfect for construction site use. They allow your employees to remain on site. Offer this convenience and boost productivity! We can supply your worksite with specially designed fences and barriers to demarcate areas of construction, excavation and demolition. They signal dangers and ensure the safety of workers and pedestrians. Rent our fences to prevent accidents. We deliver and install our dumpsters to difficult-to-reach sites, in high areas and rough terrain. We’ve got the experience you need to overcome any obstacles! Tell us about your situation: we’ll analyze your site and come up with an optimal solution so you can discard your waste safely. 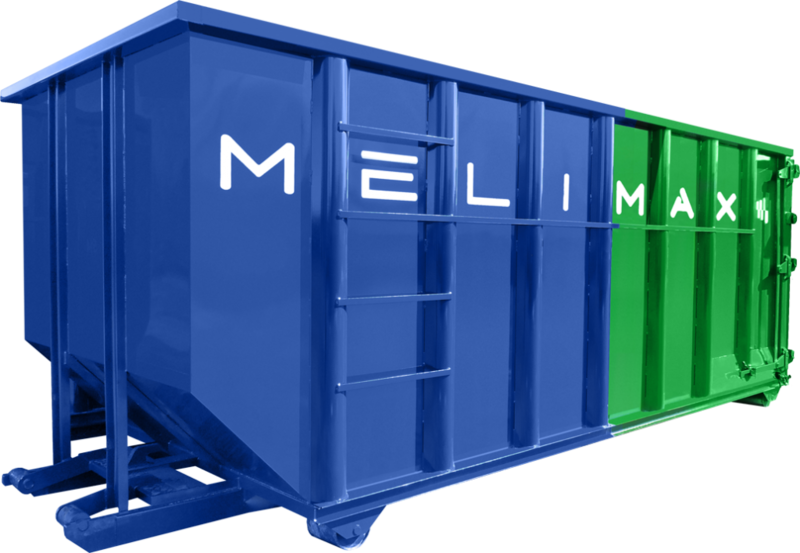 Over the phone or online, reserve your Mélimax dumpster with ease. We provide an online customer portal to all of our commercial customers, where you can access all of your information anywhere and anytime: invoices, dumpster reservations, weight tickets, LEED reports, etc.